Featured Image: Anit Thapa (in red tea-shirt and cap) marching with supporters in Kurseong town. Siliguri, 05 September: ANIT Thapa, whom Bimal Gurung expelled from Gorkha Janmukti Morcha along with Binay Tamang on 1 September, today took out a large rally in Kurseong challenging his expulsion and the indefinite shutdown that Gurung has inflicted on Darjeeling Hills since 15 June. This on a day some shops in Mirik town, located about 50 km away, lifted their shutters today defying the shutdown. Businesses at Panighata, a hamlet about 35 km from Mirik, were the first to defy the prolonged bandh yesterday. Upbeat by these back-to-back developments, Binay Tamang has convened a torch rally from Chowk Bazar in Darjeeling town at 5 pm tomorrow. The rally is for peace and is against the strike, he has told reporters. Thapa, accompanied by supporters who did not carry any flag, set out from Tindharia around 10.30 am today and as the rally progressed hundreds of people, mostly young men, joined in. It eventually turned out to be a rally of about 3,000, which going by the Hills’ standard, is large for a political rally. 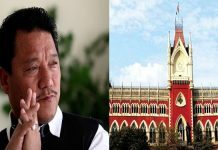 To ensure that Thapa’s rally does not face any disruption from Bimal Gurung’s camp followers, administration made elaborate security arrangements under the ldeaership of no less the DIG of Darjeeling range Humayun Kabir. Armed policemen were escorted the rally and security forces were deployed at various strategic locations. As the rally moved through the streets of Kurseong, slogans like Binay Timi Aagi Baro Janta Timro Saath Cho, Anit Timi Aagi Baro Janta Timro Saath Cho (Binay / Anit march ahead, people are with you) reverberated through the gloomy horizon of Kurseong. Gurung’s followers, mostly women and teenagers, had gathered in Kurseong town to thwart any move by Thapa to make people open their shops. But the turnout in Thapa’s rally and the massive police presence made them avoid a showdown. But some of Gurung’s women supporters mingled with Thapa’s rally and shouted slogans favouring the shutdown and hailing Gurung. Thapa, in his late early 40’s, terminated his rally at Kurseong Motor Stand, where he addressed a public meeting. 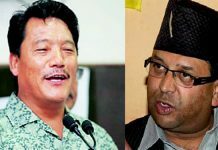 Talking to reporters, Thapa said that he will consult the people and the business communities on the on-going shutdown and support them in whatever they decide. 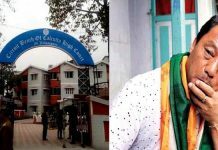 Meanwhile, a crude bomb was found on the veranda of the residence of Trinamool ward no 2 councillor Punam Biswa in Mirik today morning. Police suspect that miscreants planted the bomb to spread terror as Mirik is slowly coming out of the grip of bandh.